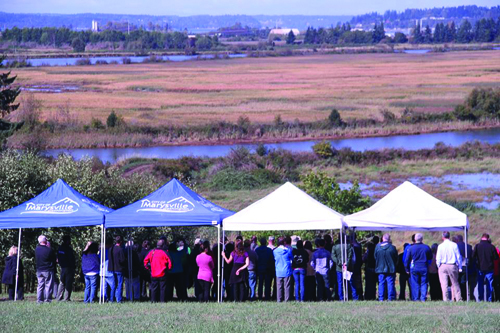 Partners from the Tulalip Tribes and a dozen other agencies and groups, including Marysville, the U.S. Army Corps of Engineers, and NOAA, take in the view of the Qwuloolt Estuary on September 2, 2015. The levee was breached August 28, allowing the return of its native marshland. The Qwuloolt Estuary Restoration Project took 20 years to complete. The finish line was crossed on Friday, August 28, when massive excavators and bulldozers breached a levee and reopened 354-acres of historic wetlands to threatened Puget Sound chinook salmon. The levee breach culminated what has been recognized as the state’s second-largest ever estuary restoration project. “This is a great, great day. It’s been a long time coming,” says Kurt Nelson, Tulalip Tribes’ Environmental Department Manager, at the September 2 levee breach celebration. “I’ve been on this project for 11 years and there have been many challenges and hurdles, but we’ve gotten through them all. What we have now is a 354-acre estuary wetland complex that saw its first tidal flows in 100 years last Friday [August 28]. The Qwuloolt Estuary Restoration Project (QERR) is a partnership of tribal, city, state and federal agencies aimed at restoring a critical tidal wetland in the Snohomish River estuary. The Qwuloolt Estuary is located within the Snohomish River floodplain approximately three miles upstream from its outlet to Puget Sound and within the Marysville City limits. The name, Qwuloolt, is a Lushootseed word meaning “salt marsh”. Historically, the area was a tidal marsh and forest scrub-shrub habitat, interlaced by tidal channels, mudflats and streams. However, because of its rich delta soil, early settlers diked, drained and began using the land for cattle and dairy farming. The levees they established along Ebey Slough, as well as the drainage channels and tide gates, effectively killed the estuary by preventing the salt water from Puget Sound from mixing with the fresh water from Jones and Allen Creeks. For the past 100 years the estuary was cut off from its connection with the tidal waters and denied the ability to act as a restorative habitat for wild-run chinook salmon and other native fish, such as coho and bull trout. Through the cooperation of its many partners, this project has returned the historic and natural influences of the rivers and tides to the Qwuloolt. The purpose of the project is to restore the Qwuloolt Estuary to historic natural conditions, while also mitigating some of the damage caused by the now defunct Tulalip Landfill on Ebey Island’s northwest edge. The former 145-acre landfill was operated on Tulalip Reservation land by Seattle Disposal Co. from 1964 to 1979 and become a Superfund site (polluted locations requiring a long-term response to clean up hazardous material contaminations) in 1995, before being cleaned up and capped in 2000. Qwuloolt will provide critical habitat for threatened Puget Sound chinook and other salmon, as well as for waterfowl and migratory birds. Native habitat and functioning tidal marsh ecosystem were lost when the estuary was diked and cut off from tidal influence. This project will restore tidal flows to the historic estuary and promote: Chinook, bull trout, steelhead, coho and cutthroat rearing habitat, salmon access to greater Allen Creek, migratory and resident bird habitat, water quality improvements, Native vegetation growth and restoration, and natural channel formation. Trying to recover these critical estuary habits are crucial to migrating juvenile salmon for the salmon recovery effort in the Snohomish region. The Qwuloolt Estuary can now, once again, provide food and refuge for those fish. The intent of the project is to increase the production and quantity of those salmon that are extremely important to the Tribe and our cultural-economic purposes, as well as to the public and State of Washington. The Qwuloolt Estuary Restoration Project is overseen by a planning team with representatives from the Tulalip Tribes, NOAA, USFWS, WDOE, U.S. Army Corps of Engineers, NRCS, and the city of Marysville. 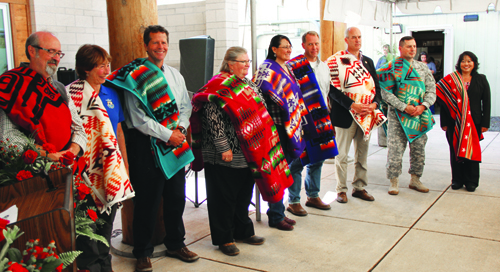 Representatives from each entity were blanketed at a September 2 event celebrating the levee breach. The US Army Corps of Engineers were responsible for the levee construction and the levee breach, while the Tribes were responsible for the channels, the berms, the planting, and some of the utility work that needed to be done. From beginning to end QERR was all about partnership and working together in getting this project done. The US Army Corps of Engineers, the Tulalip Tribes, the city of Marysville, Department of Ecology, National Oceanic and Atmospheric Administration, along with the Puget Sound Partnership and Fish and Wildlife services, all played instrumental roles in completing this project and it could not have been done without the collaboration each and every partner. *The Qwuloolt Estuary project cost $20 million. That money was obtained over a 17 year period that involved federal, state and tribal money. It also includes settlement and foundation money. Property purchase was $6 million, $2 million in planning, design, permitting and studies, $10 million on the levee, and another $2 million on constructing channels, berms and all the interior work. Physical stream restoration is a complex part of the project, which actually reroutes 1.5 miles of Jones and Allen creek channels. Scientists used historical and field analyses and aerial photographs to move the creek beds near their historic locations. Native plants and vegetation that once inhabited the area such as; various grasses, sedges, bulrush, cattails, willow, rose, Sitka spruce, pine, fir, crab apple and alder are replacing non-native invasive species. Building in stormwater protection consists of creating a 6 ½ acre water runoff storage basin that will be used to manage stormwater runoff from the nearby suburban developments to prevent erosion and filter out pollutants so they don’t flow out of the estuary. Construction of a setback levee has nearly finished and spans 4,000 feet on the western edge on Qwuloolt. The levee was constructed to protect the adjacent private and commercial property from water overflow once the levee is breached. Breaching of the existing levee that is located in the south edge of the estuary will begin after the setback reaches construction. The breaching of the levee will allow the saline and fresh water to mix within the 400-acre marsh. Other estuary restoration projects within the Snohomish River Watershed include; Ebey Slough at 14 acres, 400 acres of Union Slough/Smith Island and 60 acres of Spencer Island. The Qwuloolt Estuary Restoration Project has been a large collaboration between The Tulalip Tribes, local, county, state and federal agencies, private individuals and organizations. GRANTS PASS, Oregon (AP) – Federal wildlife officials are moving ahead with an experiment to see if killing a rival owl will help save the northern spotted owl from extinction. The U.S. Fish and Wildlife Service said Tuesday it gave final approval to a plan to send trained hunters into the woods to shoot barred owls. 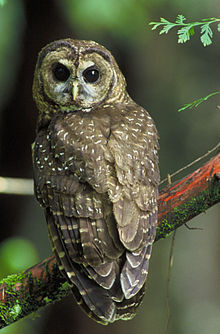 Barred owls migrated from the East and arrived in spotted owl territory in 1959. The agency says they have since become the biggest threat to spotted owl survival. Plans are to kill or capture barred owls in four study areas in Washington, Oregon and Northern California over the next four years. The spotted owl forced big changes in management of national forests when environmentalists won lawsuits to protect the old growth forests where the owls live from logging.